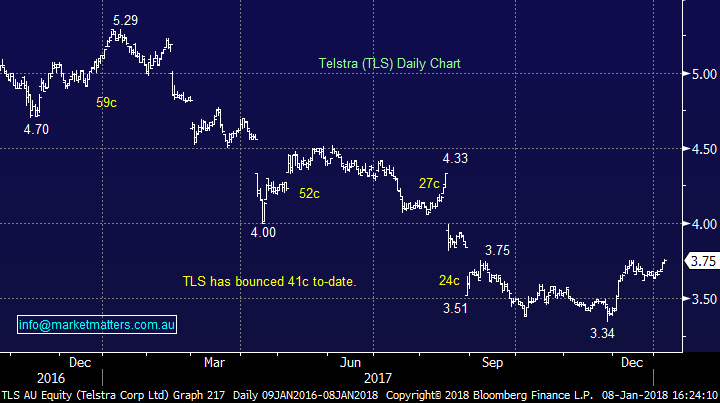 What Mattered Today; When will we sell Telstra? First day back in the office after the Christmas break although we were reasonably active throughout the period increasing cash levels in the Platinum Portfolio to 26.5% - we’ll cover this below however the market was pretty well behaved over the Christmas period and again today, although we saw early strength today being sold into - a theme that we think will play out more and more as investors come back online. We typically see a bullish December, early part of January met with some selling which more often than not leads to a weaker start to each calendar year. 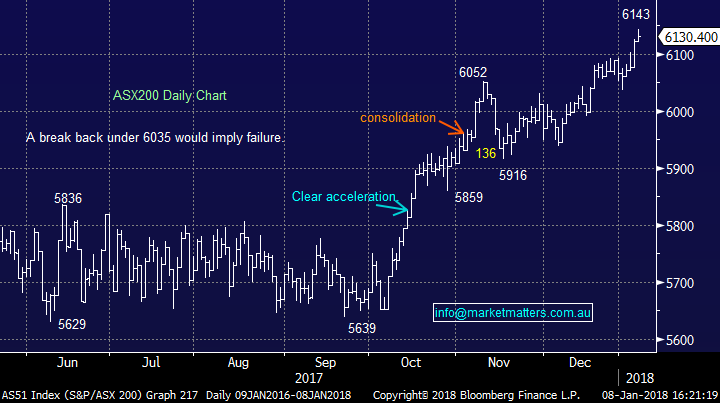 The market has simply been on an extended run north from the start of October putting on around ~8% to today’s high of 6143. Two observations worth noting. 1. All of the calendar 17 gains came at the end of the year 2. - We’re starting the year following a big Q4 gain which means we’re clearly susceptible to some profit taking, which will likely kick in once institutional managers get their feet under the desks, plan for the year ahead, look at funding redemptions and simply increasing cash given the mkts recent strength. The market does appear extended in the short term and we are wearing our sellers hat - with our buyers hat in the cupboard for now. On the market today, some love once again finding its way into the unloved stocks / sectors of 2017 which can often be the case. 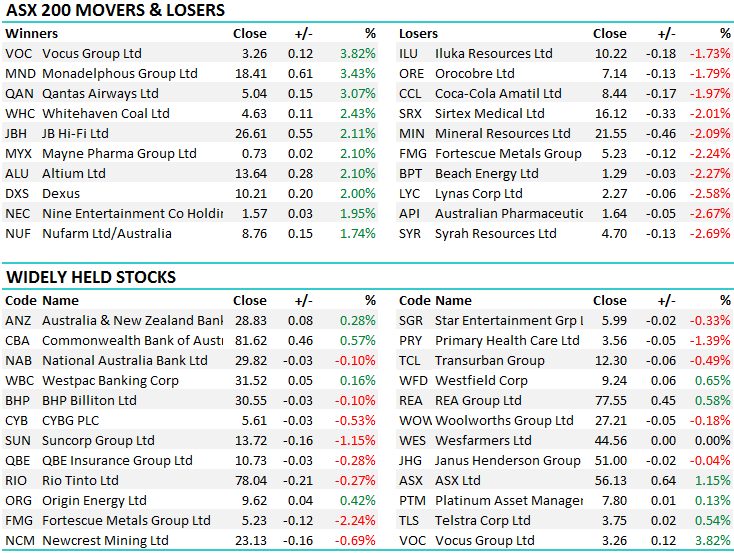 Discretionary retailers were strong - Harvey Norman particularly so adding nearly 1% in an overall flat market. 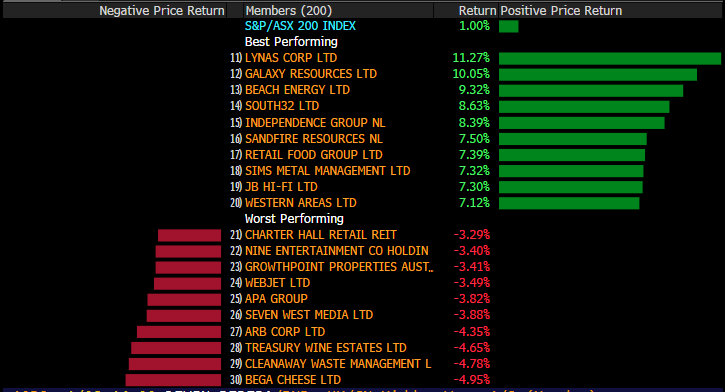 Interestingly enough, and this speaks to the idea that its worth considering sectors that are getting beaten up in the media, our two best performing holdings in the Income Portfolio are Harvey Norma and Nick Scali – companies that were no longer relevant in a post Amazon world (apparently). 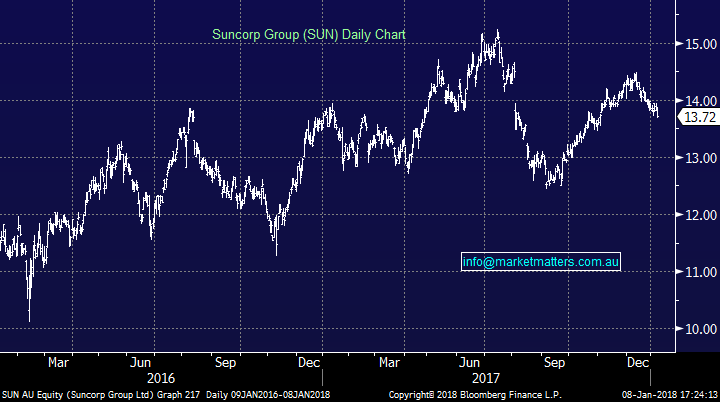 Looking at the sectors that have most strength since our last report on the 20th December, the Energy Sector was the place to be with our position in Woodside in both portfolios benefitting from continued strength in Crude. As we wrote in our 2018 Outlook this morning, we expect Crude to trade up to $US70/bbl this year dragging the energy names higher. Elsewhere, despite strength in the overall market, the interest rate sensitive sectors, the Utilities and the Real Estate stocks have struggled since our last missive on the 20th of December. 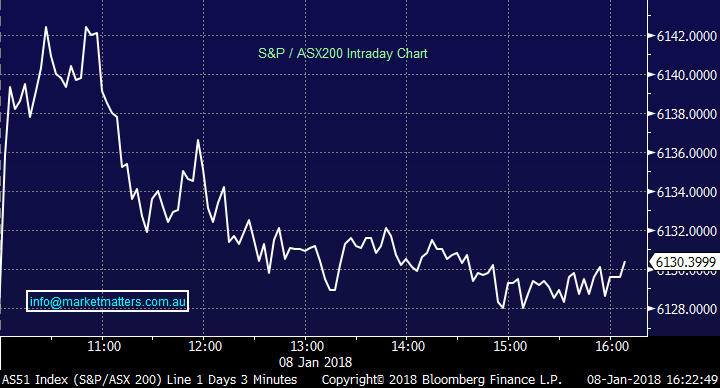 In terms of the property sector, REITs finished 2017 underperforming the broader ASX equities index both for the month of December and on a calendar year basis, snapping a 3 year “winning streak". Relative performers over 2017 included CNI, ABP, PLG, GDI and CHC while relative underperformers were led by the large Retail landlords SCG and VCX. At this juncture, the sector remains expensive trading at a 29% premium to NTA (as at 31 Dec 2017), well above its longer term average of ~21%. Now turning to specific stocks, the material names dominate the best performers over the period - we held Independence Group (IGO) in the Platinum Portfolio however used the prevailing strength to take profits. We also own Webjet which is down around 3.50% since our last report, however we remain keen on this holding, showing an ~8% paper profit. 2. 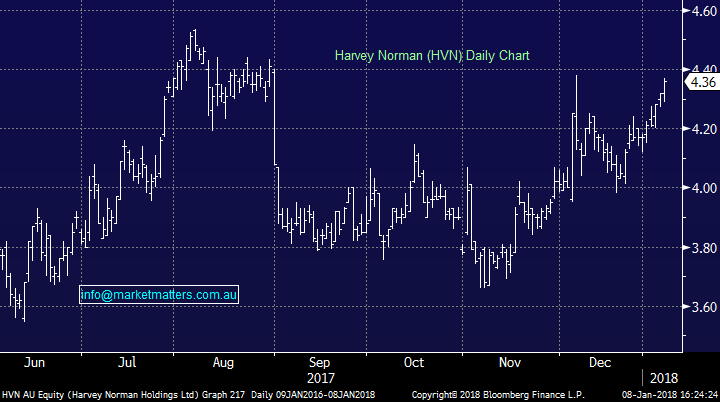 Harvey Norman (HVN) $4.36 / 0.93 %; We bought around $4 in the Income Portfolio and will be keen sellers closer to $4.60 - we’ve also picked up the dividend.